Oppo Sonica DAC brings music streaming skills to the party | What Hi-Fi? If you're listening to digital music, you really need a good DAC (digital-to-analogue converter) to get the most from your files. 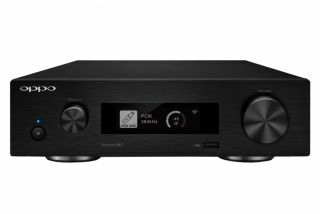 Any Oppo product is awaited with keen anticipation (take its UDP-203 Ultra HD Blu-ray player as an example), and its latest DAC not only promises fine sound, it also lets you stream music to it, making it a proper 21st century piece of kit. It's called the Oppo Sonica, and its USB input can handle PCM signals up to 32-bit/768kHz and DSD up to 25MHz. In other words, pair it with some hi-res audio files and you should really notice the difference compared with some paltry old MP3s. It accepts music files wirelessly, either from your phone or tablet via the Sonica app or from your home computer or server over wi-fi. Wirelessly, it accepts FLAC, WAV and Apple Lossless files up to 24-bit/192kHz, and DSD files at a 64x sample rate. It also interacts with the Oppo wireless multi-room system of the same name. And there's an auxiliary jack to help integrate it even further into your system. If you want to use the Sonica in conjunction with a headphone amp or power amplifier from your stereo system, there's an RCA output as well as a pair of XLR jacks for buddying it up with higher-end amplifiers. Coaxial and optical digital inputs and an ethernet port complete the connection options. Oppo has confirmed to us that the Sonica will launch in the UK soon for £799 - and we, of course, will review it just as soon as we can.